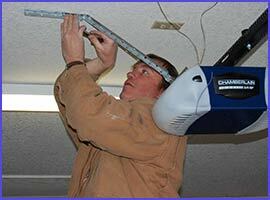 Many people can’t imagine life without their garage door opener. This small device lets you stay in the car when it’s raining out or when you have several things to carry inside. The garage door opens with just a push of a button, although it’s actually more complicated than that. If your remote won’t open or close the door, contact Neighborhood Garage Door Service for immediate repairs. We can also show you several options for a new garage door opener if you’re interested. We have stocked a wide range of options which no one else in the surrounding areas of Bellmore, NY provides. We sell garage door openers in a range of styles to fit any price range. You may just want something that gets the job done and that is fine. Other people prefer to have an opener that is as high-tech as possible. At Neighborhood Garage Door Service, we have something for everyone. We are happy to show you our inventory when we meet with you for an initial consultation.